We’ve all been watching the Boss 302R race cars in the Continental Challenge and knew that a street version could easily be build using the knowledge and experience gained there. The unplanned slip of the Boss 302 street car details by the announcer on the Speed channel coverage of the Continental Challenge race gave it all away. And it was purely by accident that we caught that slip because this was the one event we hadn’t planned to watch and only caught the last half-hour. But there were plenty of clues before that. When we saw the first picture of the Boss 302R intake manifold, and realized that it was obviously designed for production, we knew a new street Boss was imminent. Another clue was the puzzling Ford of Australia discussion of multiple versions of the “5.0” engine that would be considered for the Falcon – only 1 of which was the supercharged version they will design and build. Something was clearly up if you kept your ears open. And now Ford has made the announcement. 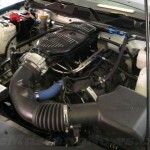 For more information on Ford Racing, visit http://www.1fordracing.com/fordracing/; additional details about Ford Racing Performance Parts can be found at http://www.fordracingparts.com/home/home.asp.